In Hiroshima, Japan the Tukusi Nursery School resembles a giant timber peanut with its swirling lines and curves. 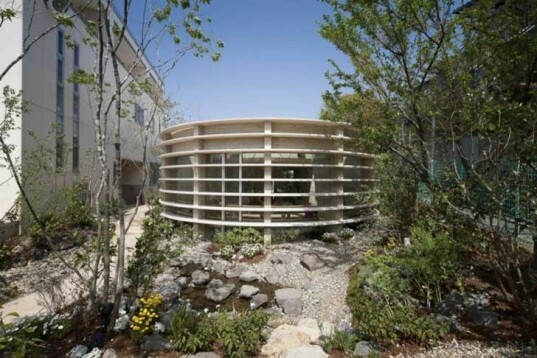 Designed by creating two overlapping circles, the open, light-filled structure allows its students to experience the changing of the seasons. Completed by architect Hiroshi Ueda and UID in 2012, the space is designed to encourage exploration and a connection with nature. Using organic shapes instead of rigid angles, the peanut-shaped nursery mirrors the rolling undulations and forms of the surrounding landscape. The idea of the peanut acts as a metaphor for protecting and nurturing young life. Just like the little legume, the Tukusi Nursery School shelters children and provides support before they venture into the world beyond. Clad completely in wood, the material was chosen to expose the children to the elements of the forest. The garden planted outside gives the view a little greenery and a place to play. Taking advantage of design to stimulate young minds, the school uses space and material as a partner in education. The idea of the peanut acts as a metaphor for protecting and nurturing young life. Just like the little legume, the Tukusi Nursery School shelters children and provides support before they venture into the world beyond. 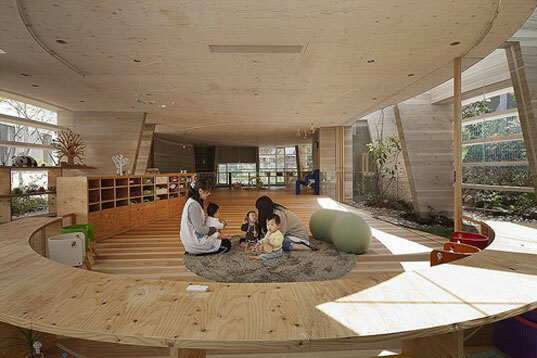 Clad completely in wood, the material was chosen to expose the children to the elements of the forest. The garden planted outside gives the view a little greenery and a place to play. Taking advantage of design to stimulate young minds, the school uses space and material as a partner in education.